David Fuller just got blindsided by a $250 hotel smoking fine. As a nonsmoker, he believes he is a victim of a money-grab scam by the proprietor. And after reviewing the facts of this case, I suspect you will too. **Fuller’s story is one more to add to our ever-growing folder of complaints against hotels. These complaints suggest that some hotels have implemented a questionable plan to increase their revenue. That scheme involves surprising guests with post-departure charges for a variety of damages. And most of these fees are billed without even a bit of evidence to support the accusation. However, a close look at this hotel smoking fine proves that some establishments aren’t very savvy in the execution of these shenanigans. Fuller’s ordeal began when he booked one night at the Extended Stay America in Sacramento, Calif. through Expedia. He decided to pay the $72 rate at the hotel and he provided his credit card for a guarantee. Fuller says that he tried to reason with the employee. Since he doesn’t smoke, there would be no reason for the hotel to assess a smoking fine. He pointed out that he was alone in his room and had no additional guests. The representative of the hotel remained unmoved and told Fuller that she would not refund the smoking penalty. This employee was very dismissive. She told me, to my complete disbelief, “You can talk to the district manager if you want, but they will side with the manager and won’t reverse the charges.” I never told her my room number or dates of stay, but she told me that someone found evidence of smoking in my room. I asked her for a corporate number, and she just gave me a customer service number. When Fuller called the Extended Stay America customer service number, the representative referred him back to the hotel. And then he was right back where he started — with an unhelpful, ill-natured front desk employee. Knowing that he could accomplish nothing with her, Fuller turned to the booking agent, Expedia, for help. Can Expedia help remove this hotel’s smoking fine? Fuller contacted Expedia and explained his dilemma. The Expedia resolution team then reached out to the hotel for an explanation. And soon Fuller realized he had hit another wall in his attempt to right this wrong. The hotel told the Expedia representatives that an employee found ashes in Fuller’s room after check out. As a result, the hotel needed to deep clean the room. The $250 smoking fine would cover this treatment. Additionally, the hotel claimed that Fuller had never complained about the smoking fine. Expedia recommended that Fuller contact the manager directly and request the evidence. And so Fuller called the hotel one more time and asked for the manager’s phone number or email. Fuller says that a person who sounded very much like the same woman he had spoken to before, refused. She gave him a general email address for the hotel and then ended their call. Fuller then sent a plea to the email address and asked once more for reconsideration of the hotel’s smoking fine. He restated his nonsmoker status and asked who found ashes in his room. Not knowing what else to do, Fuller says he did an online search of false accusations by hotels and hotel scams. And that’s when he discovered Elliott Advocacy. As Fuller read through the many cases that we have recently been battling and resolving, his hopes started to rise. He began to suspect we might be able to help him too — just like we did with Kelsey Russell. In her case, a Holiday Inn manager provided strange evidence to support its $250 smoking fine charged to her debit card. That fee was quickly reversed when I presented the oddities of this dubious evidence to the corporate parent of the franchise. And so, Fuller tried one more avenue to get this smoking fine removed from his credit card. He submitted his request to our advocacy team and asked if there was anything we could do. I reviewed Fuller’s entire paper trail and then requested a copy of his credit card bill. When I received that document, I was sure that Fuller was correct. This hotel had falsely accused him of smoking and had not been truthful about the evidence. Fuller checked into the Extended Stay America on November 8. The hotel billed the room charge on November 9 — the day he checked out. But the smoking fine was charged on November 7, the day before Fuller checked in. Now I was confused. Why hadn’t Fuller led with this significant detail in any of his correspondence with the hotel or Expedia? This implausibility is the most crucial part of his case — the part that proves the hotel made an error. I asked Fuller about the dates, and he told me that he also thought it was weird. Uh, yes, it is weird. And also odd that Fuller didn’t lead off his complaint with this bit of information. Concise communication tactics are critical to a successful problem-solving effort. In Fuller’s case, he should have immediately made it clear to the manager — the timing of the charge invalidates the hotel’s smoking fine. But Fuller’s credit card account shows the charge as a permanent transaction on Nov. 7. Now that I was sure that this hotel had charged its guest a smoking fine before arrival, it was time to track down the manager. As with all of the other hotels I have dealt with recently, the manager of this hotel was quite elusive. I called the hotel and asked for the manager. There was a long pause and then the employee told me he wasn’t there. So I asked for his email. And I received the same response that Fuller received. She gave me the hotel’s general email address. I repeated that I was looking for the manager’s email. “That’s it,” she told me. Fuller confirmed that Kirst was the manager who called him. The one who promised he would not refund the hotel’s smoking fine. We were contacted by one of your recent guests with a disturbing story. David Fuller stayed at your hotel on Nov. 8 for one night. He is a nonsmoker. However, your hotel charged him a $250 smoking fee after someone claimed they found ashes in his room. There is a big problem with this accusation. 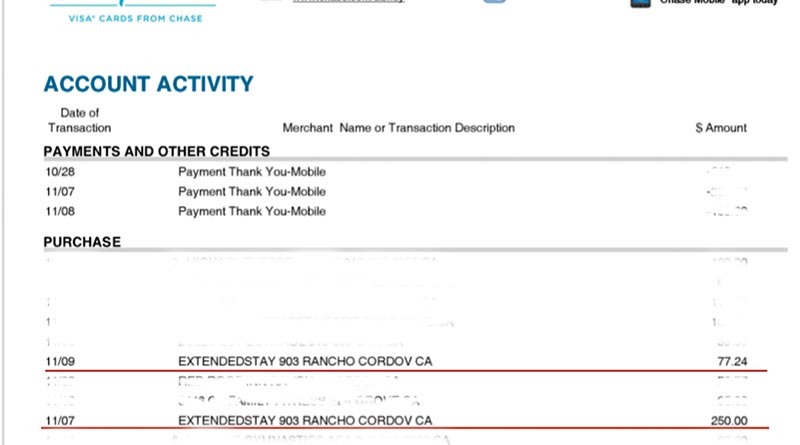 His credit card statement, which I have a copy of, shows that your hotel processed that smoking fee on Nov. 7 which is the day BEFORE he arrived at your hotel. Obviously, this must be a clerical mistake that should be corrected immediately for your guest. We will be publishing an article about his experience so I welcome your explanation as to how this happened as well as the return of your guest’s $250. And although the unavailable Kirst never answered me, the next day the hotel processed the refund of Fuller’s pre-stay smoking fine. **Author’s note: Days after we published this story, the executive office of Extended Stay America responded. The hotel continues to maintain that this is a valid smoking fine and that the charge was processed on Nov. 10. The executive I spoke to is investigating why Fuller’s November credit card statement lists the charge as Nov. 7. Additionally, he has asked the hotel if an incident report can be provided to support this fine. Lastly, he also informed me that this particular property is not franchised and is owned and operated by Extended Stay America. As such, I have corrected the article to remove references that imply this property is a franchise. I will update the story when/if more information becomes available. Do you think there should be repercussions for this type of money-grab by a hotel?